I don't think I'll ever stop learning about the Law of Attraction. I'm constantly learning how this amazing law works. When I started this website, I wasn't sure if anyone would read it. The Law of Attraction always came easily to me. Many people said I was just lucky, but I knew it was more than luck. I saw what the people around me were doing – how they were acting, what they were saying, what they thought about themselves and their lives – and I knew that what I was doing was quite different. It was these differences that I wanted to share with the world. The truth is that you can change your world (completely) and that the change begins with you. I don't like to limit myself to just one teacher when I learn the Law of Attraction, or even just one area of study. I think it's important that you expand your knowledge as much as possible. Study quantum physics, philosophy, Buddhism, the Bible, Neville Goddard… They all cover Law of Attraction. They each have different ways of explaining things. Sometimes you have to take bits and pieces from different teachers and different fields of study. You might hear one person tell you something a hundred times, but it isn't until someone else says it slightly differently that you have a real “a-ha” moment. Heck, I think one of the greatest teachings on the Law of Attraction is Plato's Allegory of the Cave. Plato certainly isn't someone people turn to often today to understand how to manifest their dreams, but he does give great insight into how our thoughts and beliefs affect us and our reality. I enjoy listening to free webinars and classes to learn Law of Attraction. The teachers are experts in their field. They share a lot of great information on how to manifest your desires and offer free coaching during the class. Sick of dream boards and affirmations? Want to change your life in 5 days? I hear you and that's why I'm joining the Free Morning Mentor video series offered by Mary Morrissey. Mary is a mix of inspiration, practical wisdom and the most amazing manifester I know. She has been featured in the films, “The Moses Code” and “Beyond the Secret”, spoken at the United Nations, and coached thousands of people on how to create their dream life. This isn't your ordinary woo-woo positive thinking! Mary is different. She is teaching a practical and real manifesting formula that is proven to have helped thousands of people change their lives. Secret Tip: The first video reveals the 2 hidden signals the Universe is sending you to help guide you to a life you live. You can watch the first video here. 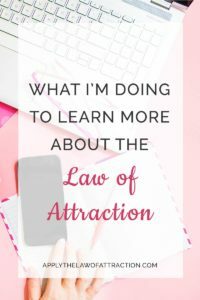 I've shared my favorite Law of Attraction books with you before. However, I continue to learn the Law of Attraction from reading books – new and old alike. Sometimes I gain new insights, sometimes they simply help to keep me in the right frame of mine. Leveraging the Universe: 7 Steps to Engage Life's Magic by Mike Dooley. It provides a step-by-step guide to using the Law of Attraction to see immediate, long-lasting results. What are you doing to learn the Law of Attraction?